I’m the first person to admit that I’m not a “naturally” organized person. It’s the hoarder in me-I always think I’ll find a use for something eventually and I never want to get rid of anything! If left to my own devices I’d be a mess. Luckily I married the most organized man in the universe and over the past 11 years he’s managed to help me gain control over my tendency towards clutter. Today I’m going to help you declutter too! 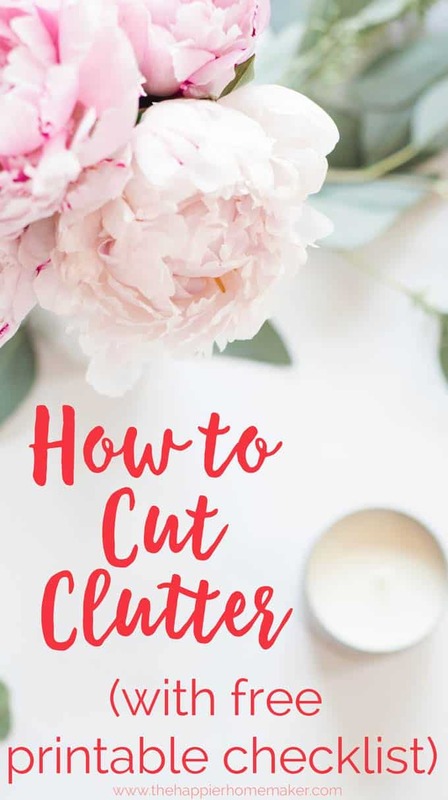 Like any change in behavior, learning to cut clutter in your home is a process you have to be intentional about until it becomes a set habit. For some of us it may never come 100% naturally but the good news is that by creating a routine you can keep control over the clutter in your house without a huge time investment. If you’re starting out and your home is filled with a lot of clutter I want to say first off-give yourself grace and take your time. It will take a while to get through many of these tasks and get to a “clean slate” starting place that will be easy to maintain. If you’re able, try to start with my Spring Cleaning Checklist or 7 Day Spring Cleaning Challenge-it will get your home in tip-top shape quickly. 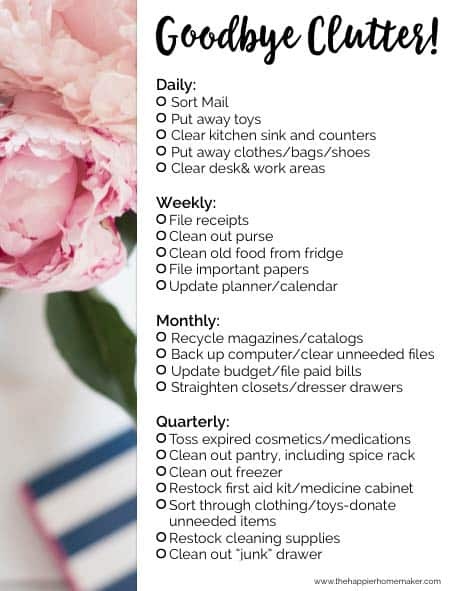 If you can’t start with a full cleaning, slowly work through all of the items on the list (even the monthly and quarterly ones) as your times allows. Eventually you will get to a place where it will only take a a little bit of daily investment to maintain your clutter free home. Don’t get overwhelmed, most of these tasks take less than 15 minutes to finish-do what you can! Are there any decluttering tasks that aren’t on my list you’d recommend? How naturally organized are you? Let me know in the comments! An awesome checklist! Maintaining a house clean and in good condition is hard, especially when there are children around. They like to clutter 🙂 Thanks for sharing these ideas with us! Thanks so much for your ideas and information. Thanks so very much for your help.